Weather Watchers Check This Out! When I used to live in Florida, I was addicted to the weather channel as soon as Hurrican Season started. Given, I lived down there during some particularly active years, but it was still a bit of a freakish hobby. Now that I’m up north however, I still find myself wanting to watch the meteorologists predict the path of every topical storm and hurricane that swirls into existence. You can turn on layers to show projected paths and historical tracks. The severity of the storm is color coded from Tropical Depression to Category 5 Hurricane. 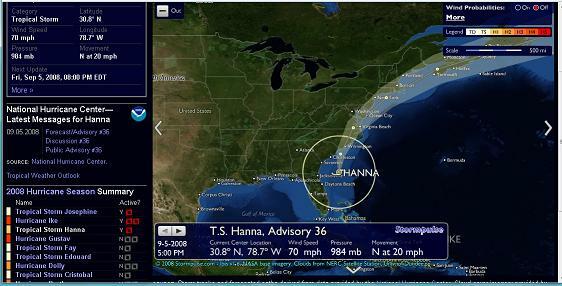 You can see all active hurricanes at once, drag the map around, or click on a specific storm. The site also offers satellite pictures and storm news. As a long time follower of NOAA, I am very intrigued by the visual tracking and variety of interactive information this site provides. It pulls data from resources such as the National Hurricane Center, so you can probably trust this site’s projections just as much, if not more, than your local weatherman’s.